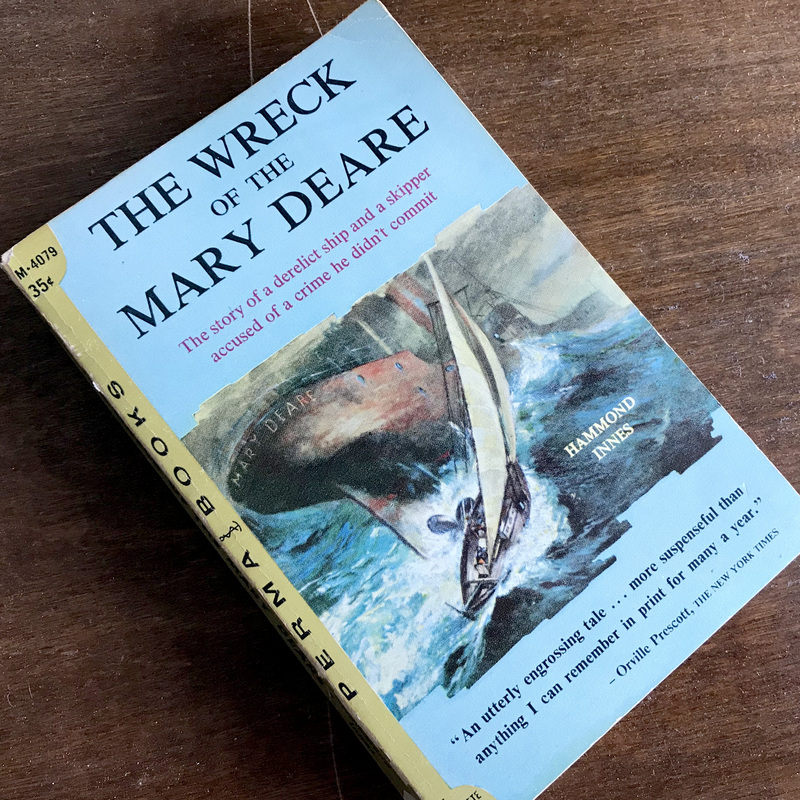 The Wreck of the Mary Deare, written in 1956 by Hammond Innes, belongs to the genre of adventure and drama tales that crosses the gap between great literature and pure entertainment. For a land-lubber who’s only sea-faring experience is a few long off-shore jaunts on deep-sea fishing boats, a couple of yacht trips, and the growl of coastal ferries, its difficult to grasp all the sea-farer lingo. I had to look up salty terms like “fo’c’sl” and “binnacle,” and find out what it meant to “lay to” in a coal-fired steamer. I had to search out some place-names, learn some geography, look at the Minkies on a map of the English channel to discover they were nearly to France. Its standard fare for a good book set in reality at sea. It was like reading Erskine Childers’ Riddle of the Sands all over again, keeping a dictionary at hand and my map app open. But this was just the part of reading that draws me in and saturates me in expertise. I find it tiring and dull to read authors with little experience in their subject matter, be that the sea-tides, or a life filled with love and pain. People who have never ridden out a channel gale or put a three-island steamer aground in a swell can’t write about such things in a way that brings a novice like me along in a convincing manner. I love books in which the author’s real-world clout can be felt as clearly as the tooth of the paper of the old pulpy page. Books written from simple second-hand hearsay, from a lack of real-life experience, or from imaginations of how things ought to be usually gleaned from other books, usually fall short. They strike me as watered-down soup and are thin as the paper of the page. Innes does not disappoint, he writes what he knows. The reader can feel the experience of a man who’s loved, lived, won, lost, risked, wrangled, and even lived through a few gales. But it is the author’s insight into the drive of a man’s inward desperation that elevates the tale from mere sea-bravado to a story of making-right at all cost. Gideon S. Patch, captain of the ill-fated cargo steamer Mary Deare, becomes the driving force of the book. Told and played out against the cautiously-adventurous narrator, salvage man John Sands, the tale puts these two strangers together and ties them up in a mysterious relationship through which Patch seeks his personal redemption. Patch has a patchy past, and it is dredged up with every turn of the tide (see what I did there?). Caught up in a mystery that gradually exposes a conspiracy, we must unravel the web along with our two seamen. The story takes us in three acts from the sea, to the court room, to the sea again. In each chapter we gain entry into the mind of man pushed to the limit of mental and physical endurance, laid along side the mind of another man driven by compassion and the obligation to do right. Those men, set against the odds, overcome the evil intentions of some very bad souls, the cold self-interests of insurance brokers, the preconceptions of a court and watching public, and the impersonal harshness of nature. It is a stirring drama that delivers rich people who are deeply personal. It is not a flat tale of bearded men in cableknit sweaters shaking fists at the mean old sea. Innes avoids that cheap crutch of lesser writers by keeping the language free from crass obscenities. Though perhaps a product of his time, this is a refreshing restrain common to the time. Where the grit of foul-minded men must come to the forefront of the tale, it is skillfully handled without dipping into the easy fallback of profanity. The very few uses of swearing and oaths then come with much greater value and a powerful punch. I truly appreciate this restraint. I am of the strong opinion, despite what the post-post-modern notions say, that it does not make a story “more real” or more authentic simply because it includes the lowest kind of language. If such characters cannot be separated from such language, they aren’t compelling characters at all. Profanity-laden characters generally turn out to be caricatures of the common masses of common people who follow each other in common pursuit of common cultural foibles, all the while thinking they are ‘more real’ because they pepper their speech with the witless profane. And that’s all too common. The book is very British in its tone. It captures the mid-twentieth century mentality of manner and form, though not the stuffy kind. It reminded me of my British family, my mother and her half of my family tree being post-war transplants to the states. Lowbrow dialect, straight from the Southampton wharf, is used when thuggish brutes make their threats and imposing intentions known, and it provides the spice where the profane would undermine reality. We also get a glimpse of such setting-rich details like the proper-like, gentlemanly, slightly-disinterested, thumbs-in-vest-pockets air of a court staff getting on with the day’s business of ruining a man’s life. It was crafted with an old-world richness, but just enough to season the tale, not enough to be forced and clunky. The story was richly rewarding. I did not expect to be so moved by the quick wrap up at the end, for the hopelessness of the inhuman plight carried on until the unread pages were becoming alarmingly few. But, delightfully, as the narrative closed out from dozens of grueling pages of deathly tension and perseverance through the most awful despair, the resolution of the drama was gratifying, right and good. I almost wanted to cheer. 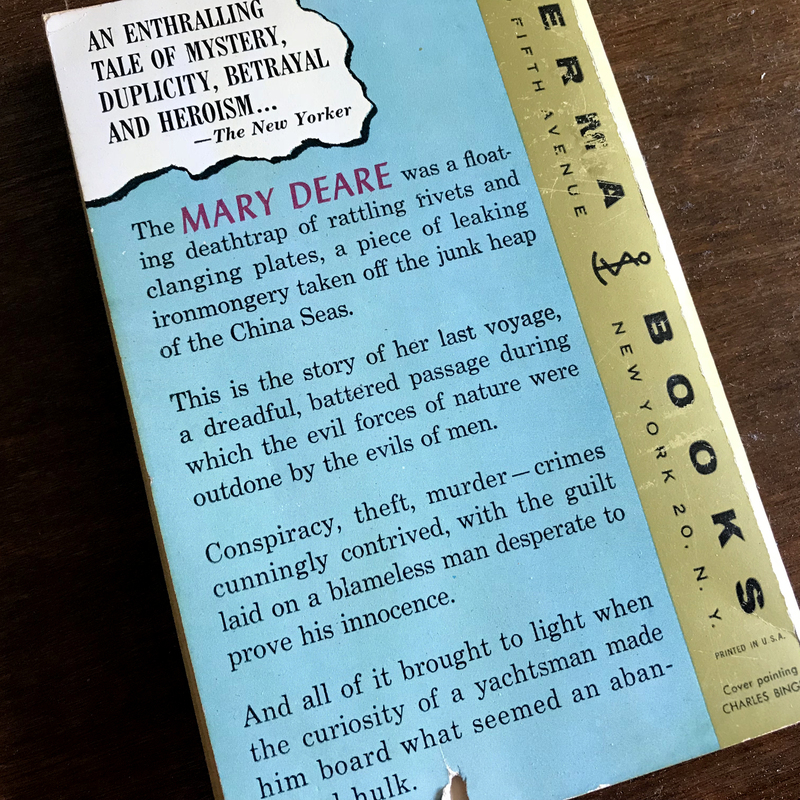 If you are looking for a good tale of intrigue, mystery and adventure that does not lay on the backs of flat characters, this tale will satisfy. I read a crusty old Permabook paperback edition published in 1957, the fourth version of the year-old book. It held up, and I chose it for the illustration on the cover. Don’t let the poorly rendered covers of various editions sway your opinion, nor the cheesy photos lifted from the film-adaptation, which feature Gary Cooper and Charlton Heston in the lead roles. The book was popular, and for good reason. Popular books too often get wrapped in lousy, eye-catching covers of graphic gore and visual hype, but this book out-performs the 50’s commercial artists, thankfully. It is a great read.